Enviro-types don't have much to be cheery about these days. Climate legislation has sputtered out. Jay Rockefeller is trying to delay the federal government's ability to rein in greenhouse gases. And the party of climate denialism is poised to grab a bunch of seats in Congress next year. So that means carbon emissions are just going to keep rising without end, right? Well, not necessarily. Although it's not getting much attention, the EPA is currently proposing a series of pollution rules for the nation's fleet of coal plants that could end up having an enormous climate impact. The first thing to note is that coal-fired power plants don't just emit heat-trapping gases that warm the planet. They also churn out mercury, which accumulates in fish and causes developmental problems in young children. They belch out sulfur-dioxide, which creates acid rain. They send up nitrogen-dioxide, which helps form ground-level ozone and leads to all sorts of respiratory and cardiovascular problems, sending tens of thousands to the hospital each year. 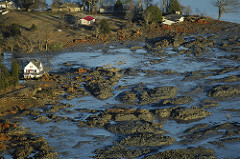 They produce coal-ash waste that can poison surrounding areas, as happened in 2008, when a dike broke at a Tennessee Valley Authority plant, creating a sludge flood that will cost up to $825 million to clean up. That's an eye-popping number. If 20 percent of U.S. coal generation gets retired in the next five years, that would lead to a roughly 7 percent decrease in the country's overall carbon emissions. That's already nearly halfway to Obama's pledge at Copenhagen to cut emissions 17 percent by 2020. And note that these coal-plant shutdowns even if Congress doesn't pass a climate bill. They'll happen even if Jay Rockefeller succeeds in crippling the EPA's greenhouse-gas authority. Utilities might be able to sue to delay the pollution rules, but they can't resist the inevitable forever. The next question, then, is what will replace all those coal plants. Right now, many power companies are leaning toward cleaner natural gas, which is expected to stay cheap thanks to the recent discovery of vast new shale reserves. But some utilities may lean toward renewable sources like solar or wind—or even invest in efficiency, the cheapest power source of all. Congress could make sure that the latter options takes precedent by passing some sort of renewable power and efficiency standard for utilities, although Harry Reid recently said that even this measure probably couldn't garner 60 votes in the Senate. Environmentalists are already girding themselves to make this the next big legislative fight, now that cap-and-trade is dead. It's also worth noting that most of these coming pollution restrictions easily pass cost-benefit analyses. The EPA, for instance, is proposing to cut U.S. mercury emissions by 50 percent. According to its own analysis, the cost of this rule will come to $3.6 billion per year, while the health benefits would amount to $44 billion annually: "These benefits include preventing between 2,000 and 5,200 premature deaths, and about 36,000 asthma attacks a year." Indeed, it's quite possible that these air-quality rules could end up doing even more for public health than the giant health care bill passed earlier this year. That alone should counteract claims that curbing fossil-fuel pollution is somehow unaffordable or not worth doing.